Although we have lost a few days on site to wet weather in the month of June, during the last week we have experienced blue skies, hot and sunny days, and just enough breeze to keep the midges at bay.....although we have been plagued by cleggs! Clegg bites aside, the excellent weather of late has allowed work to proceed well on site. 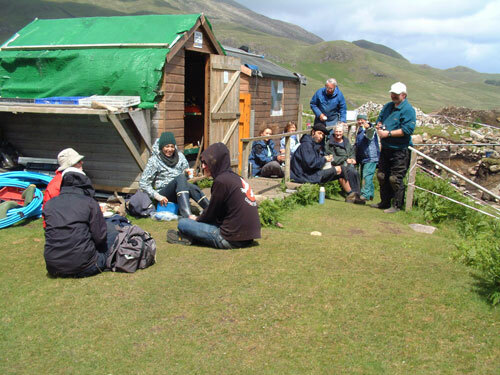 We have also been blessed with a great team of volunteers, all willing to tackle the tasks we throw at them! Work has progressed well in Trench 19, where we have been removing the last of the burnt mound deposits and are now evaluating a small range of features and contexts pre-dating the formation of the burnt mound - around 2500 to 2400 years ago. The dry conditions have made it quite difficult to interpret and excavate some of the finer contexts on site, as can be seen in this image of Trench 19. After trowelling back an area, the sun soon dried the surface out and the colours of the sediments started to fade. 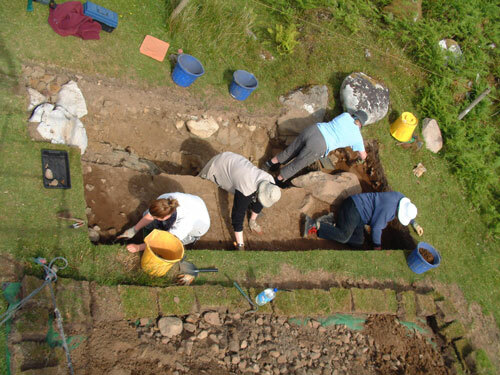 In the image above, Sara and Sheila (the older) are exposing the foundation courses of a small, double-skinned wall, which trends across the trench. The only finds recovered from this area of Trench 19 included a fragment of cannel-coal bracelet and a fine socketed iron gouge - the latter quite a rare find from Iron Age Scotland (recovered by Kath Small). The image above shows the same feature and associated contexts after an overnight rain shower.....note the enhanced colours of the different contexts. The image below shows a closer view of the wall feature, the function of which is unclear at the moment. We have also extended Trench 19 to the southwest in order to evaluate a group of small and related features that were initially uncovered during the 2008 fieldwork season. The image below shows the trench during removal of the overlying burnt mound deposits to reveal an organic-rich sediment containing burnt bone fragments and significant amounts of charcoal. The features, which include a post-hole that is just starting to show has a void between packing stones, pre-date the formation of the burnt mound. 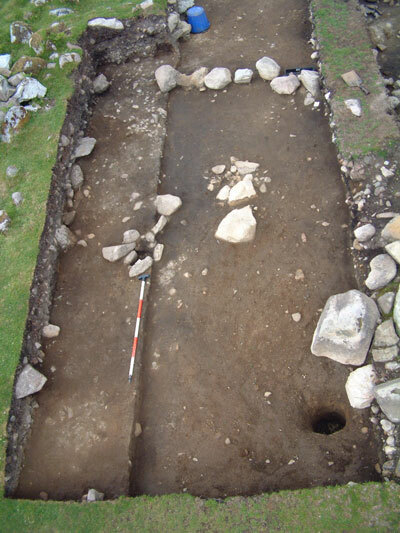 The image below shows an aerial view of the trench and associated features including the post-hole at lower right that was excavated in 2008 - charcoal from this feature has now been dated to around 2450 years before present. 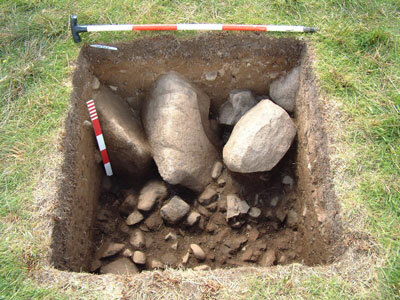 The low wall, comprising a single course of boulders was also revealed during the 2008 fieldwork season and is contemporary with the post-hole. 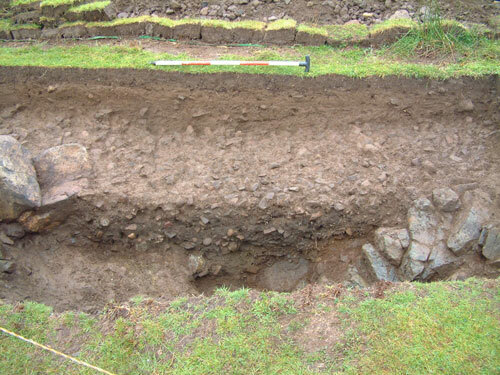 Finally, the image below shows the same trench after the overnight rain shower, revealing the colours of the sediments and other associated features including the post-hole with packing stones at left, and a possible stone-filled pit to the right. The features will be excavated over the next few days and I will bring further news from this area of the site soon. 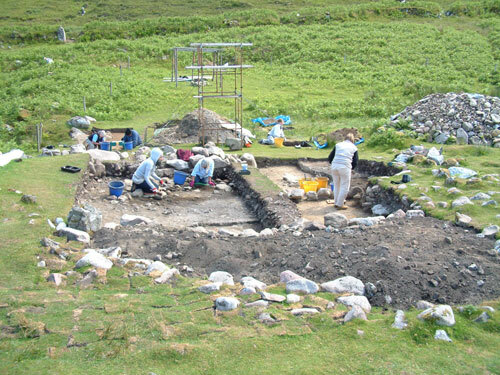 Work in Trench 20 was initiated in 2008 to evaluate what we thought may be the main access used for the High Pasture Cave site. 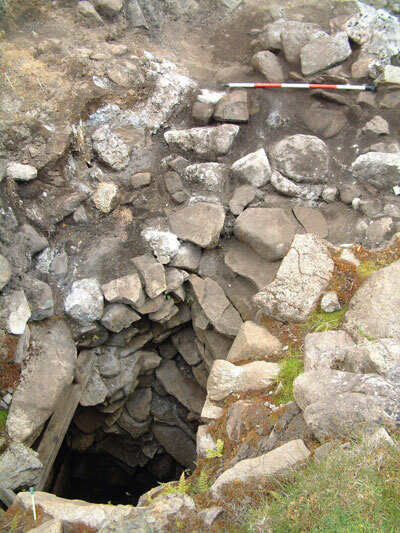 Geophysical surveys had revealed what appeared to be a cut through a volcanic dyke that runs through this area of the site, while survey and trial trenches had investigated a large stone wall that terminates at this potential feature. 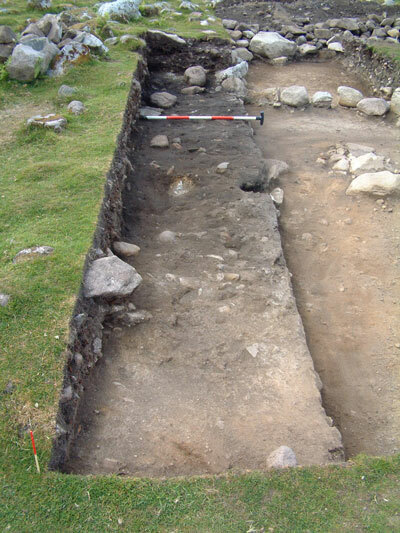 Excavations in 2008 revealed the cut in the dyke, which had been filled with compacted deposits of fire-cracked stone (burnt mound deposits). Several finds were recovered from these deposits including an iron pin, a bronze ring, iron slag and a small sherd of pottery. A one metre wide extension to the trench this year has revealed more compacted deposits of fire-cracked stone (see images below) and another lump of iron slag (how many people can you get in a 4 metres long by 1 metre wide trench!!). 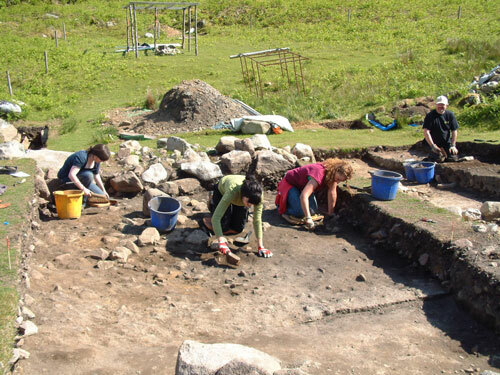 There is still quite a lot of fill to take out of the cut feature over the next few days, which will hopefully allow us to make more informed interpretations in this area of the site. 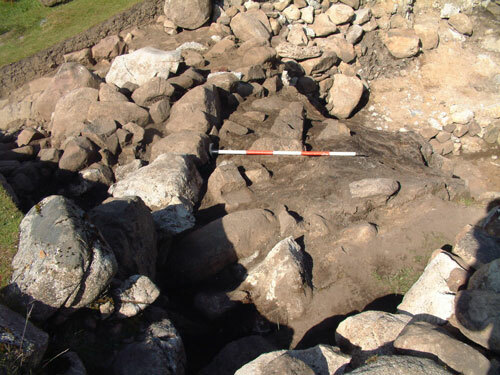 The image below shows the compacted nature of the burnt mound material in this cut feature, which may have been used to form an access route into the site. Because the geophysical survey highlighted this feature and it’s continuation to the northeast for some distance, we will place additional test trenches across it to fully evaluate context and function. During the last week, we have also excavated several test pits and small trenches to evaluate geophysical anomalies in the east of the site. In particular, we would like to investigate the full extent of the burnt mound in this area of the site and a sharp spike on the magnetometry that suggests a possible ferrous source. 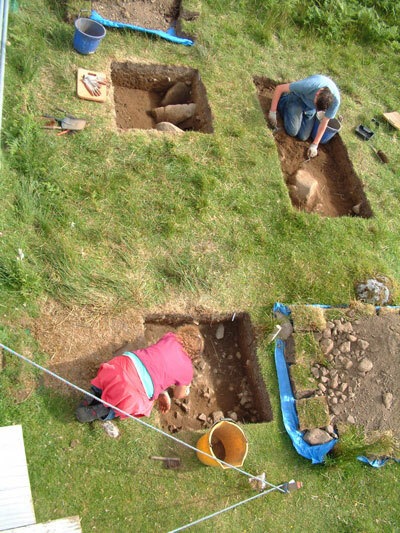 The image above shows Stephanie and Jamie excavating the first of the test pits revealing burnt mound deposits and what appears to be a large linear wall feature. The image below shows the surface of the burnt mound in Test Pit 4, which is overlain by deep amd sterile slope-wash deposits. 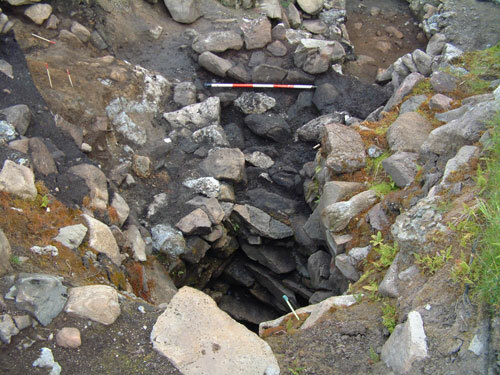 Test Pit 5 (see image below) was found to contain large granite boulders, possibly tumble from a wall, with compacted deposits of fire-cracked stone to the north. Test Pit 6, which is centred on the geophysical anomaly (see image below), has also revealed a possible continuation of the wall. These test pits will be extended and excavated over the next couple of weeks to allow us evaluate more completely the archaeological deposits and structures in this area of the site. Excavations are continuing within the natural hollow immediately outside the stairwell and cave entrance to High Pasture Cave, to continue our investigations of the major features uncovered in this area over the past year including the wall that defines the main activity area at the site and the earlier paved walkway that pre-dates the construction of the stairwell. The inner face of the large wall that surrounds the stairwell entrance can be seen in the image above, taken from the northeast, while the image below shows the wall from the southwest after the removal of more archaeological deposits from the inside face of the feature. 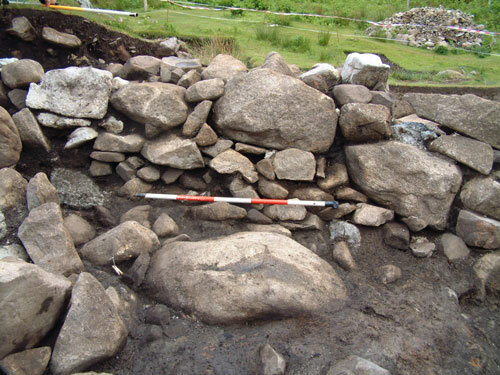 The image below shows the inside face of the wall, displaying a random build comprising smaller stones for the foundation courses interspersed and overlain by some very large granite glacial erratic boulders. 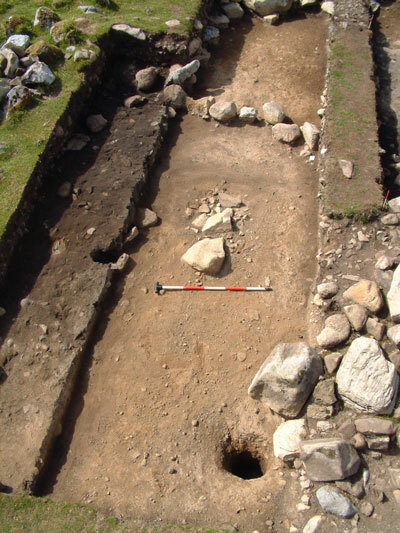 Few finds have been recovered from the excavations in this trench to date, although over the last couple of weeks we have found two partially used granite saddle querns, small degraded sherds of pottery and some shellfish remains and animal bone fragments. 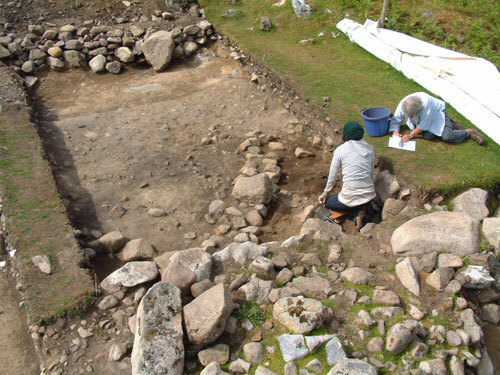 The exposed wall has now been recorded in detail and we have started to excavate a section through this substantial structure to investigate its construction and morphology. Below the wall, we still have a substantial depth and quantity of archaeological deposits to remove before we reach the level of the paved walkway. Excavation of the landing outside the stairwell entrance to High Pasture Cave and the northeast side of the structure is starting to reveal some of the complexities and deposition of materials in this sector of the site. The image above shows the stairwell from the east/southeast, after revealing the curved wall leading in to the head of the stairwell. The reddish-coloured boulder seen within the construction of the wall comprises half of a large granite saddle quern. The quern had been built working face in to the wall. 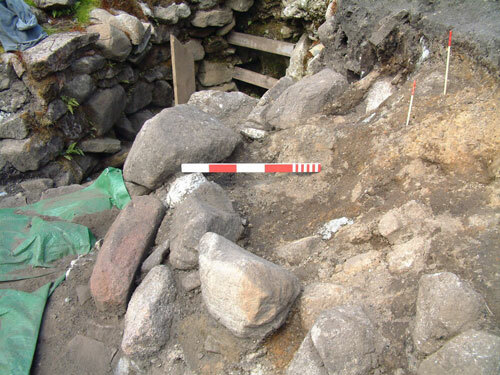 The sadlle quern after recovery from the wall (see image above). 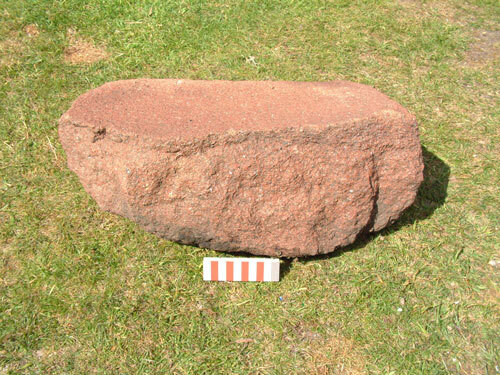 During the past couple of weeks on site, we have recovered four fragments of saddle quern stones, one of which had been found in the burnt mound (the quern had been subjected to high temperatures and contained severe fractures within the fabric of the object. 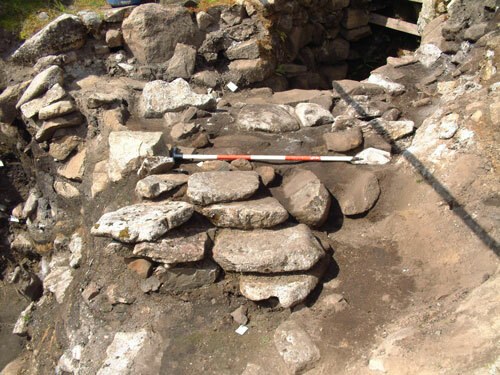 Excavations at the head of the stairwell have so far revealed at least two phases of construction, including two distinct landings complete with paving stones and revetment walls. The image above shows one of these horizons, with the paving slabs of the landing leading to the lip of the stairwell. 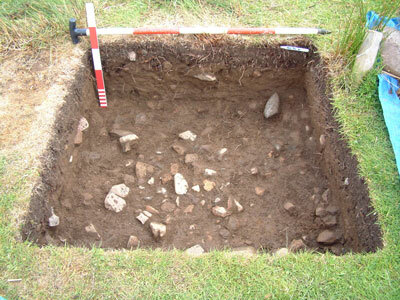 Several small finds have been recovered from this area including pebble grinders and hammers, a cushion stone or anvil, and several sherds of decorated pottery. 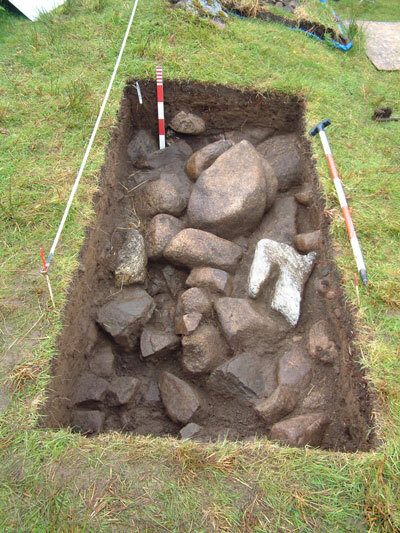 Wet-sieving of the archaeological deposits have produced some large pieces of charcoal and large quantities of carbonised grain (primarily barley). The image above shows a view down into the head of the stairwell and the exposed paving slabs and revetment wall, the latter of which displays a gradual curve, leading into the stairwell. 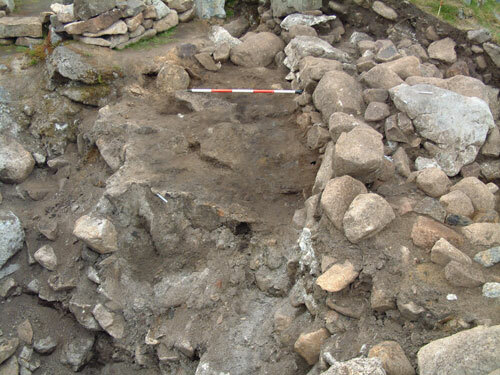 The continued excavations at the head of the stairwell have also uncovered the remains of two large hearth settings, one overlying the other, which almost block the access to the stairwell. 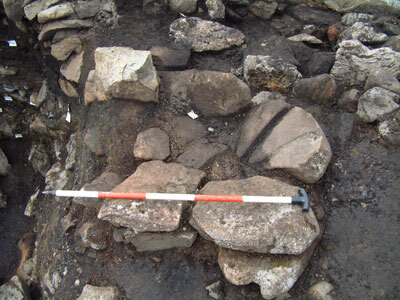 The image below shows the upper hearth setting, which is located immediately above the one metre long scale. 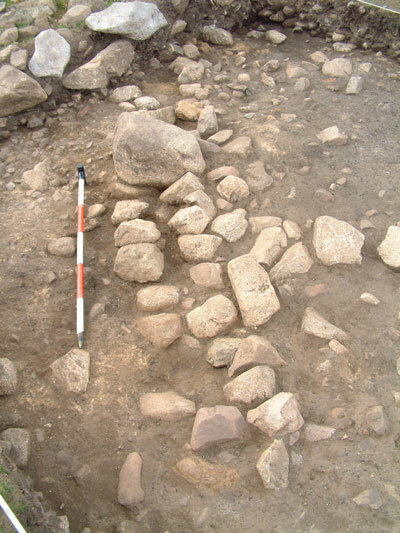 Large quantities of calcined/burnt bone were recovered from in and around the hearths, along with some charcoal. 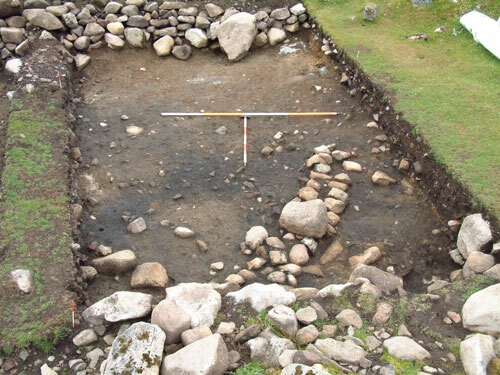 The image below shows the upper hearth setting during excavation.